This blog focuses on the Federal Milk Orders that pay for protein. Approximately 6 million of the 9 million lactating cows in the U.S. are paid by the Class III component formulas. More than half of the cows not included in the Federal Milk Order prices are in California. Approximately 1 million are in the federal milk orders that pay on the advanced pricing model. In this post, we'll examine the prices for the federal milk orders that pay on the advanced pricing model. Those milk orders are primarily in the Southeastern U.S., and are named "Application, Southeast, and Florida. The Arizona/Las Vegas Order is also paid on the advanced pricing model. 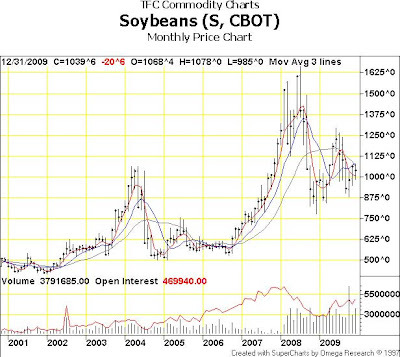 The formulas are clearly stated in the Price Formulas - 2010 posted on the USDA site. In these orders, producers are paid on pound of skim milk + butterfat. The value of the skim milk is the greater of the class III skim pricing or the class IV skim pricing. In 2009, it was nearly 50/50. In eight of the months, the Class I skim price was based on the class III formula and in four of the months, it was based on the Class IV formulas. When the price is based on the Class IV formulas the difference is small, as shown below. The impact of the Class IV formulas is negligible. In earlier posts we have discussed how the health of the U.S. Dairy industry is very dependent on the price of cheese. The price of cheese is dependent on the export market. This is true not just of the Federal Orders paid on components, but is also true of the Federal Orders paid on the advanced pricing model. The Class I model does not pay producers directly for protein because the payment is based on cwt of skim milk plus pounds of butterfat, however the skim price which makes up most of the check, is very dependent on the cheese prices. The most recent advanced pricing announcement was made a week ago. Prices for the Federal Orders paid on components will be made next Friday. The release dates for 2010 Federal Milk Order Price Data are available in this link. The impact of the January Class III prices will be reviewed in the blog next week. When the U.S. Dollar (USD) is weak, the demand for U.S. cheese is greater as the cheese is less expensive on the global markets. In late 2007 and early 2008, the USD was very weak and export demand for U.S. cheese hit new highs. Then the USD strengthened considerably and demand for U.S. cheese on the global market took a nose dive. 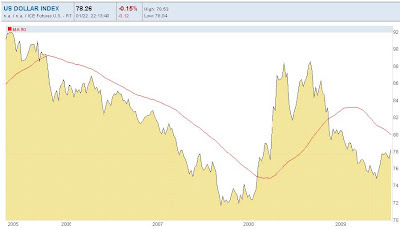 Currently, the USD has weakened again but has not dipped to the very weak levels early 2008. Currently, the USD has leveled off at a mid level valuation. In mid 2008, the New Zealand Dollar (NZD) was very strong, making New Zealand expensive on the global market. In late 2008 and early 2009, the NZD weakened significantly, increasing the demand for New Zealand cheese. It has now strengthened again and leveled off slightly below the 2008 highs. One could say that New Zealand cheese currently is "moderately expensive". After reaching record highs in late 2007 and early 2008, cheese prices fell significantly in late 2008 and early 2009, partially as a result of the exchange rates mentioned above. They have now recovered somewhat, but based on the January, 2010 prices to date, they will probably level off near the current prices. As a result, the spectacular Class III milk highs of late 2007 and 2008 fell to half that level in early 2009. They have now recovered near the mid point of that range and will probably stay there in the immediate future. Corn prices have not returned to their long term $2.50/bushel levels, but they have come down from the extremes near $7.50 that occurred with the rapid expansion of the ethanol business. They appear to be settling in around $3.50/bushel. Similarly, Soybean prices have not returned to the $5/bushel long term price level, but they have fallen from the $15 highs when soybean acreage was planted with corn during the ethanol expansion. The prices appear to be settling in around $10/bushel. The number of cows has decreased and will continue to decrease, but will not hit the lows predicted only a few months ago by the USDA. There must be optimism in the dairy industry. It would appear that the dairy market is stabilizing. There are no outrageous highs and no disastrous lows. What could be better for the dairy industry? In the next post, we'll examine the advanced pricing model. What are the drivers for higher prices in that sector? In many of the previous posts, we have examined the impact of imports and exports of cheese on cheese prices. Class III milk price is nearly totally dependent on the market price of cheese. As shown below, 2008 was an outstanding year for cheese exports, leading to some very high cheese prices and therefore very high milk prices reaching $20/cwt. As the USD strengthened, U.S. Cheese became too expensive on the international market, Exports took a significant dip and as a result of the changing supply & demand factors, the price of cheese fell drastically. While cheese exports are very important to milk pricing, cheese makes up less than 20% of dairy exports. If you include whey exports, Cheese and whey together make up nearly 40% of dairy exports. Non-fat dry milk is actually the biggest dairy export item. When you consider all dairy exports, the fluctuations between 2008 and 2009 are much bigger than the fluctuation in cheese exports alone. The chart below shows the percentage makeup of dairy exports. Cheese and whey and "Other" (primarily food products with dairy ingredients) become more important as a percentage due to the extreme fluctuation in nonfat dairy milk exports. To further illustrate this, the chart below shows only cheese, whey, and nonfat dry milk exports. Nonfat dry milk is very sensitive to exchange rates and therefore can play a role in overall demand for U.S. milk. This data is available at the US Dairy Export Council. This group, funded primarily by the DMI "Checkoff" program has, as it's sole purpose, the support of dairy exports. They have all necessary forms to assist in registering products for import in other countries and they participate in assisting dairy product producers to expand exports. Actively participating in developing exports very important for milk prices. It is arguably more important than anything else in increasing demand for U.S. dairy products. Prices for December 2009 were announced on December 31. 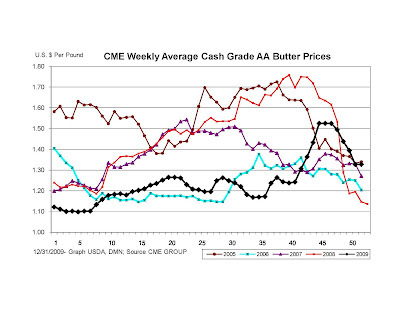 Both Protein and Butterfat prices reached new highs of $2.88/lb and $1.54/lb respectively. This calculated to a $14.98/cwt price for Class III milk. These increases reflect the increase in NASS Survey prices for cheese barrels and blocks as shown graphically in the following two charts. Barrels leveled off near $1.50/lb with a slight dip in the last week. Barrels continued their increase reaching $1.69/lb in the last week. So much for the good news, it's now time to think ahead to January, 2010. 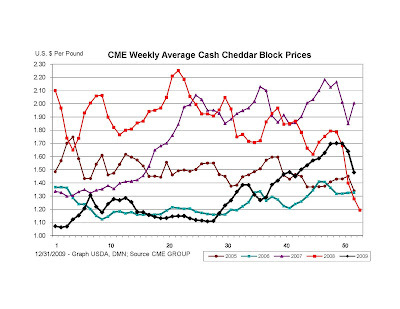 Unfortunately, cheese blocks fell dramatically on the CME in the last two weeks. The NASS survey price which lags the CME price by about 2 weeks, will reflect this in the first two weeks of January. In previous posts, the high inventory levels of cheese were forecast to be a problem which will have to be reckoned with before cheese prices stabilize at higher levels. The historically high inventory levels were expected to drop as the milk pricing recovery got underway. Unfortunately, just the opposite has happened. 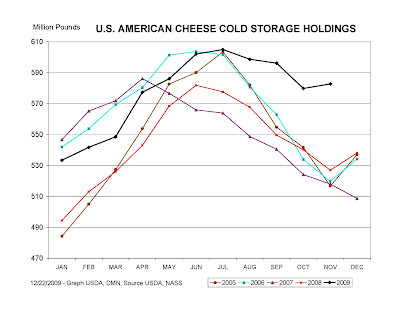 Cheese inventories have taken a significant leap to historic levels for this time of the year. Only November inventory levels are available until this Friday when December's should be available. 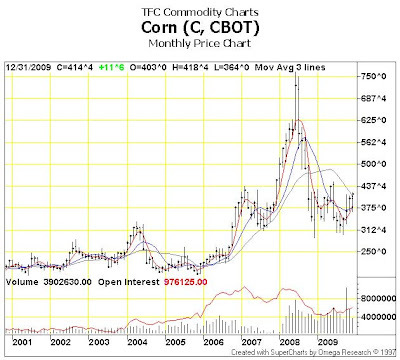 Also troubling is the significant drop in Butter prices on the CME in the last few weeks of the year. Simply stated, celebrate now because January prices are not trending positively. In future posts, these trends will be followed.